Run’s House. Yeah, if you’re a Run-D.M.C fan like me, then you’ll definitely know what song I’m referring to. 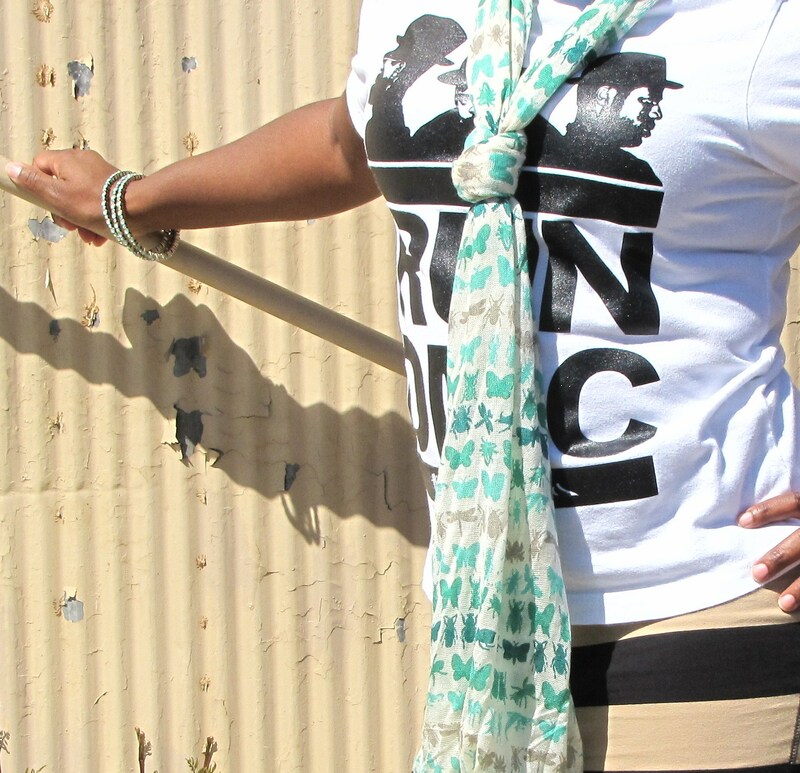 This week I paired one of my favorite t-shirts with a pencil skirt and mint green heels. What did I end up with? I guess you could say Hip-Hop meets girly-girl. What was really fun was combining the styles to see what the result would be. Well, I was very happy with the result. Not to mention, I was able to wear my mint green heels which I could go on and on about. to that bouquet of flowers. Okay, so not necessarily to a bouquet of flowers, but to a floral print dress. A very bright dress at that. I used to run in the other direction when it came to wearing colors. Maybe my apprehension was due to the fact that colors draw the eye. I of course used the excuse that black was more slimming, which it can be. 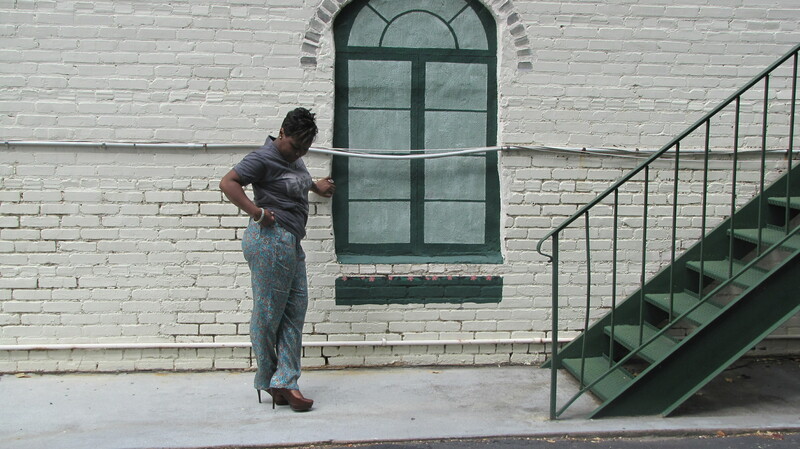 But really, I was afraid of color and was a self-proclaimed hater of floral prints. Look at me now. It’s like I’ve gone from one end of the spectrum to the other. Still, I can’t abandon my edgy-ness (I know it’s not a real word). So as a result, a paired my yellow floral print sundress with a black leather belt and black leather platforms, metal studs and all. So a big part of my style is being comfortable yet unique, and I love pairing pieces that you might be a bit squeamish about seeing together. Although I love fashion and trends, there is a part of me that just wants to be comfortable. One way that I achieve comfort is by wearing t-shirts. Yes, I have drawers full of them. So the thought came to me; why not showcase a part of what makes my style just that, mine. I would be lying if I said I wasn’t comfortable in a pair of sweats or jeans, some sneakers, and a Tee. There is however a part of me that loves the pretty side of fashion too. You know; the different textures, colors and silhouettes (Gotta love it). So just like my personality, my style and love of fashion is multifaceted. I wouldn’t be honest about my style and personal expression of fashion if I didn’t pay homage to what has contributed to a large part of my wardrobe. So here it is; Tee’d off Tuesdays. you just have to look for them, but sometimes they’re right in front of your face. Take for instance the fact that I’ve been getting over a cold this week and I was halfway through my bag of Halls (thanks sis) before I noticed the little messages of motivation on every wrapper. I think it’s pretty cute, and who knows how many people have been perked up when they’re under the weather because of one of these little sayings. So today, put a little strut in it…and keep it going for the rest of the week.